With all the rain brought to us by Danny, I sat in my craft cave and got busy on some projects I have dying to put together. Though anyone that knows me would tell you I enjoy the rush of procrastination!! Ha Ha! 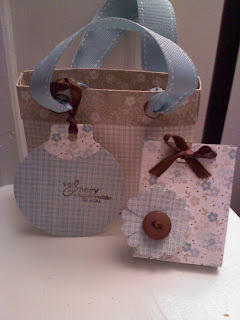 I made a three series - Gift tag, gift bag and small little treat bag. All with coordinating papers (all retired SU!). I had fun with it - that is all that mattered. My daughter was around and gave the thumbs up for the idea and the end project, and at 12 I guess its a hit!!! So - thank you Danny for raining so I could be in the craft cave- not feeling as guilty as I could've, and letting me relaxing after week one of the beginning of deployment. Its meant alot. 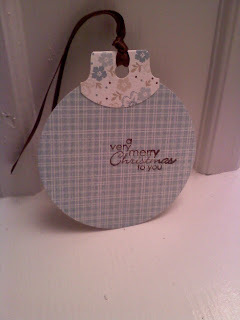 The punched ornament as a tag. I like the simplicity of it- and the style. 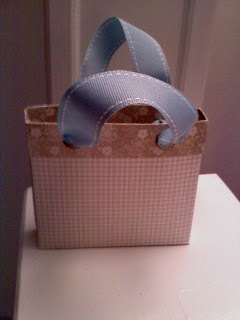 This gift bag is so cute. I like that the ribbon handles are big enough and manly enough we can give to our masculine men for their gifts! All three items, in Parisan paper, which I love so much and am sad its not longer available. I think they will be great no matter what the paper is... for all occasions. Hey almost NO INKY FINGERS! !